University of Arizona Head Coach Frank Busch nicknamed his All-American swimmer ‘Pearl’. It was a common theme for the coach to give his athletes nicknames, but this one would ring especially true for Olympian Lacey Nymeyer, who left Beijing with silver around her neck and enjoys making jewelry in her spare time. She began learning her technique in the pool at the age of six and became a very focused swimmer. 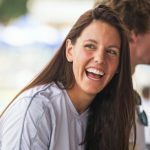 In high school, she was a four-time All-Arizona swimmer and a 3-time USA Swimming Scholastic All-American. Having trained with her club team in the Wildcat pool, she decided her best opportunity to grow as a swimmer was right in her backyard. As a senior, Nymeyer helped lead the Wildcats to their first ever National Championship in women’s swimming. She was part of four NCAA title relays. She ended her career winning more NCAA titles then any swimmer in Arizona history, 10. It won’t be long until she is inducted into the Arizona Hall of Fame, just like her grandfather who played basketball for the Wildcats. Over the span of just over a year, Nymeyer set a world record, captured gold at the 2007 World Championships and won an Olympic silver medal on her first trip to the Olympic Games. In Beijing, she earned her silver medal as part of the 400m freestyle relay team that included Natalie Coughlin, Kara Lynn Joyce and Dara Torres. Known for her prowess in relay events, Nymeyer is the consummate team player in a sport with an individual focus. 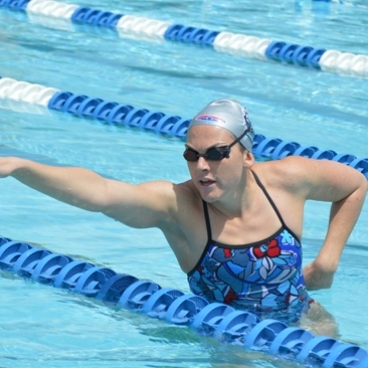 A freestyle specialist, USA Swimming had her ranked in the top six nationally for the 50m, 100m and 200m freestyle. She is renowned for her stroke, so much so that U.S. Head Women’s Coach Jack Baurle referred to it as the best stroke, men’s or women’s, on the U.S. Olympic Team. 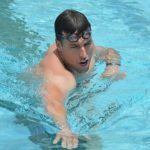 Nymeyer’s successes at Arizona were not limited to the pool. While studying physical education, she earned a GPA of 3.84, earning her Academic All Pac-10 honors, ESPN The Magazine Academic All District honors, Arizona’s Ruby award for the top student athlete and the Pac-10 Toyo Tires Scholar Athlete of the Year Award for Women’s Swimming. An avid writer, Nymeyer enjoys journaling and the catharsis it generates. Writing runs in the family as her mother, Stacey, blogged for the NBC affiliate in Tucson during the family’s trip to Beijing. Nymeyer also enjoys spending time with her family, especially when it involves water sports on the lake. On October 18, 2009, Lacey Nymeyer was honored by the NCAA as the Woman of the Year. The award honors student athletes who have completed their college eligibility, demonstrated academic and athletic excellence and engaged in community service and leadership opportunities. Lacey loves dipping her toes in the water with the kids at Fitter and Faster clinics, and she hopes to impart aspects of her perfect technique along the way.